Six years into his sobriety, Gaylen Eamon’s second wife left him — on his birthday. He realized that recovery from drug and alcohol addiction would require more than he’d bargained for. He had begun attending Alcoholics Anonymous (AA) meetings when he turned 50, experiencing “miraculous changes” as he worked through AA’s 12-step program of surrendering to a “higher power” and taking responsibility for his choices. But as he reclaimed his sobriety, Eamon wasn’t sold on the idea of returning to the Catholic faith in which he’d been raised. “I had a 13-year-old’s opinion of why I didn’t like the church,” Eamon said. Through a series of divine nudges — including a retreat at the Abbey of Gethsemani, home of Trappist monk and author Thomas Merton — Eamon found himself at midnight Mass one Christmas Eve. “I walked up the steps backwards, but I ended up inside the church,” he said, describing the roundabout path that led him to back Catholicism in 2011 after a 35-year exile. 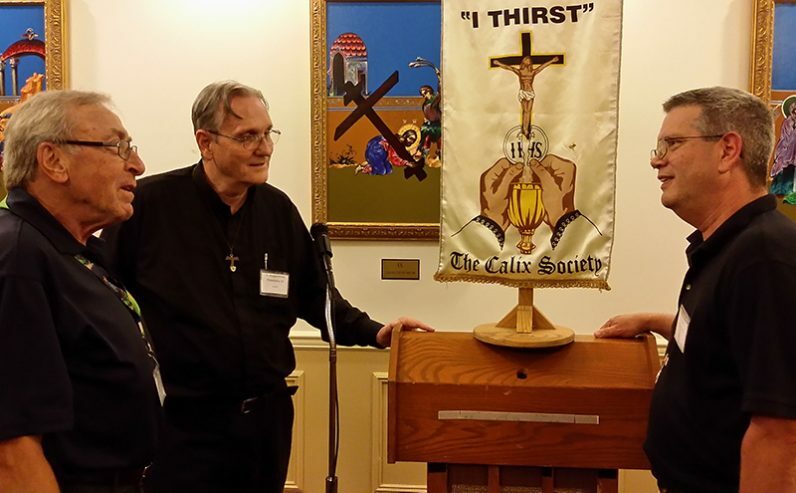 Eamon reached a new milestone in his journey when he was elected president of the Calix Society, an international association based in Glenside that promotes spirituality among sober Catholic alcoholics. The U.S. group held its annual gathering at Malvern Retreat House Aug. 3-5. “It all started over an alcoholic priest back in 1947,” said Father Douglas McKay, the national chaplain for Calix and the founder of Our House Ministries, a Catholic recovery outreach in the Grays Ferry section of Philadelphia. Father McKay said that five concerned laymen, all from the Minneapolis area, petitioned to have a 5 a.m. daily Mass celebrated in order to pray for an addicted priest’s recovery. After several weeks of sacrificial Masses, the priest was able to maintain his sobriety, and the Calix Society — named after the Latin word for “cup” — formed shortly thereafter. Often (and somewhat controversially) nicknamed the “Catholic AA,” the Calix Society has chapters throughout the United States, Ireland and the United Kingdom. While exact membership figures are not available, Calix leaders estimate there are currently some 1,000 participants worldwide. Local groups must obtain permission to form from their diocesan bishop, and priests are asked to serve as chaplains whenever possible. In the greater Philadelphia area Calix groups, or “units,” meet at several area parishes including St. Patrick’s in Norristown, Nativity of the Blessed Virgin Mary in Media, Queen of the Universe in Levittown and St. Gabriel’s in Philadelphia, where Our House Ministries is based. A unit also meets in Wilmington, Del. at St. Matthew Catholic Church, and a virtual meeting, available online and by telephone, can be accessed by emailing admin@calixde.org. Despite its origin as a ministry to alcoholics, the group welcomes all who wish to support those in any kind of recovery, even if they themselves do not personally struggle with addiction. The group focuses on promoting the spiritual development of its members, and meetings generally begin with a celebration of Mass, followed by reflection and fellowship. Devotions such as eucharistic adoration and the rosary, along with frequent reception of the sacraments and retreats, figure prominently in Calix’s programming, which was commended by Pope Paul VI in a 1974 address to the group. Father McKay notes that the Catholic Church is uniquely qualified to assist those struggling with addiction. Calix members emphasize the importance of sacramental grace as a path to sobriety. Father McKay, who has spent over 40 years in addiction ministry, added that the opioid epidemic makes the work of Calix more relevant than ever. Through the personal sanctification of its members, Calix strives to evangelize others as part of the universal call to holiness. For more information on the Calix Society, visit www.calixsociety.org. Additional information on the Archdiocese of Philadelphia’s spiritual resources for recovery can be found at archphila.org/hopeinchrist. Read CatholicPhilly.com’s six-part series on “The Opioid Epidemic: A Catholic Perspective,” winner of the Catholic Press Association’s 2018 award for best investigative/news analysis journalism.